An Illinois legislator beginning his career in the Depression Era, Paul Powell became Secretary of State in 1965. He passed away in 1970, leaving behind $800,000 of cash found in shoeboxes and strongboxes in his Springfield hotel room. Powell's legacy as an example of Illinois political corruption has been written about in Time Magazine and the Chicago Tribune as recently as 2008. Since the term of office for Secretary of State is four years and the sack says, "Re-elect," one can surmise that these were printed for the 1968 campaign. 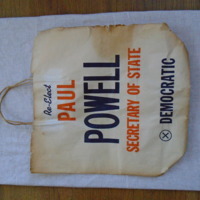 Paper sack with print, "Re-Elect Paul Powell Secretary of State x Democratic"
“Paul Powell paper sack,” UIS History Harvest, accessed April 22, 2019, http://uishistharv1.uis.edu/items/show/206.